Jordan Riewer drives to the basket. 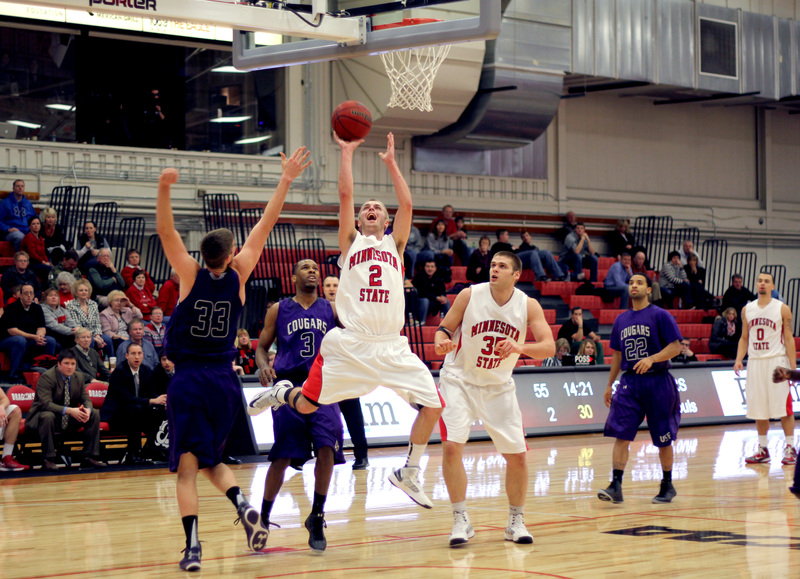 The MSUM men’s basketball team earned a split in their home games this weekend. The Dragons took on the University of Sioux Falls (S.D.) Cougars Friday finishing with an 80-53 win. MSUM came out in the first half with strong momentum and set the pace for the game with good ball-screen defense. Capitalizing on turnovers and shooting over 60 percent to create a 20-point lead over the Cougars by half time. In the second half, the Dragons came out with relentless intensity and kept the lead. Eleven of the Dragon players lent a hand in the 55 percent shooting while holding the Cougars to just 34 percent. Alex Novak led the team with 18 points, four rebounds and two assists. The Dragons went into Saturday’s game against Southwest Minnesota State University with a confidence that wasn’t transferred onto the court. With a game that highlighted 10 ties and 11 lead changes, the Dragons turnovers gave 15 extra points for the Mustangs in the first half alone. However, two lay-ups and a 3-pointer from senior guard Anthony Tucker gave the Dragons a 39-31 lead at halftime. The Mustangs came out with good ball movement and offensive rebounds in the second half to tie the game at 45 by 14:56. The Dragons and Mustangs flip-flopped the lead for the remainder of the half. The Dragons were trailing by three at the end of the second half until freshman Tyler Vaughan drained a NBA 3-pointer with only six seconds, sending the game into overtime. In overtime, the Dragons kept fighting, but a six point run by the Mustangs crushed their hopes as the Dragons fell 86-82. Head coach Chad Walthall and Tucker agreed that offensive rebounds and turnovers contributed to the heart-wrenching loss against the Mustangs. Tucker was named player of the game with 30 points, including 5 of 9 from the 3-point line and two assists. Freshman Ben Figini added 14 points while Alex Novak pitched in a double-double with 12 points, 11 rebounds and led with four assists. Riewer finished the game with 12 points and three assists.